Email outreach tools are a godsend in today’s digital world. These tools allow you to automate sending personalised emails to a targeted audience with a planned frequency. Most tools also come with predefined templates which further simplify the email copywriting process and just leave to you needing to add your own touch to give your emails some personalised flair. 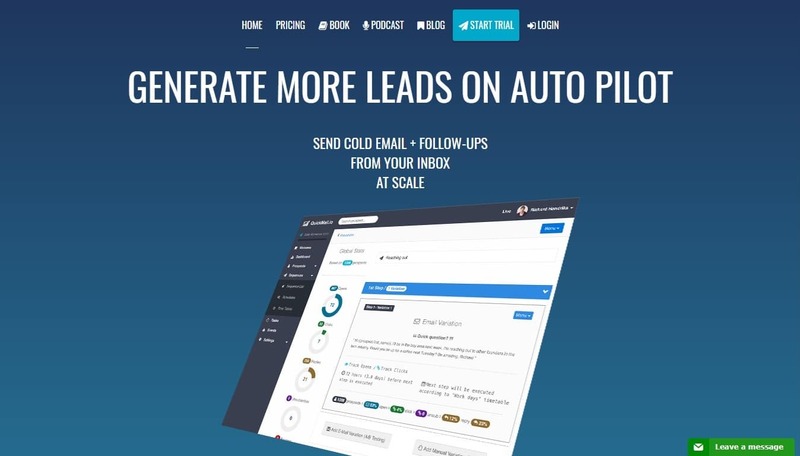 These software tools are usually used to send one to one emails to potential leads and customers to kickstart a conversation and help building a new relationship. As they connect to your actual email address, all emails are sent from your email provider. For example, if I was using one of these tools, I would connect them to my Gsuite account and all emails sent would actually come from my email [email protected]. This sets them apart from commonplace email sending tools like MailChimp, AWeber, and GetResponse which are usually used to send company-wide newsletters and promotions to large lists of subscribers. However, in addition to helping you send simple and personal messages at scale, these email outreach tools also offer a whole host of other benefits. For instance, they allow you to use “merge fields” or “variables” to personalise your message. You’re able to track how many recipients actually opened and click your emails unlike your usual Outlook or Gmail client. This is all well and good but the real benefit to using one of these tools is the results that you’ll get. 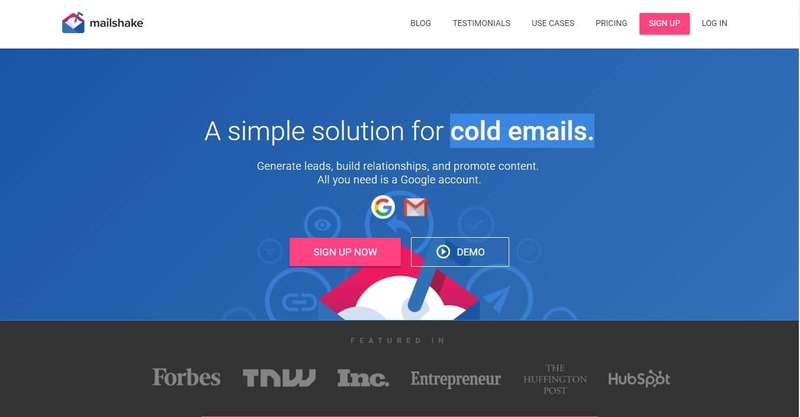 If you’ve got a specific goal in mind for email outreach, using one of these tools to automate the process allows you to reach many more inboxes in much less time. Getting results from email is a numbers game when it comes down to it. The more high quality, personalised emails you can send to your target audience, the more success you’ll have. In this post, we will discuss a few important benefits of email outreach tools for businesses, strategies to create effective outreach emails, and introduce you to a few leading email outreach tools. Most email outreach tools offer a free ‘basic’ model, which usually limits the number of emails you can send. However, even the paid plans for most tools cost between $50-$100 per month. If done right, the amount of new conversations that will be started between your team and your prospects will be far greater than most other outbound channels and the returns from these conversations will be well in excess of the investments made. In addition to the direct financial benefits, email outreach tools can help you save time and eliminate manual errors, leading to further efficiencies. Email outreach tools allow you to hyper-personalise your message to potential customers and clients. From the greeting to the mention of company names and industries – you can customise the emails you send out using data that you’ve already got. Research has shown that emails with personalised messages have a transaction rate that is nearly six times that of generic “cookie cutter” content. Segmentation is made easy which helps you ensure that the email messages you send are relevant to the recipients which increases the chances of a reply or click. Arguably, the biggest advantage offered by email outreach tools is analytical support. Most of these tools have access to reports that show email open rates, click through rates and reply rates as well as A/B split testing. This allows you to easily test the effectiveness of your marketing strategies by testing different messages and analysing the results. Personalise, Target and Personalise Some More! Once you have identified a target segment, you need to add several elements of personalisation to your emails that are relevant to that segment. The goal is to make it seem like a personal one-on-one email interaction between you and your potential customer. Where possible, begin the email with the recipient’s name and include a line or two about a challenge they could be facing related to their industry or business type. If you have content relevant to the segment and their potential problems, be sure to add the appropriate links and knowledge openly. Once you have established a connection and have their attention use the second half of your email to pitch your service, demonstrate what value you bring to the table. You could explain well-known industry challenges that you have solved, name a few leading companies that you have done business with, or even share information regarding a recent company achievement to demonstrate your expertise. The pitch needs to be brief, to-the-point, and carefully worded in a way that resonates with the target audience. If appropriate, you could then end by asking for a suitable time for an appointment or a phone call to follow-up in person. If you have not heard back from the contact, make sure a follow-up email is planned for within a few days of the original email being sent. In the follow-up email, reference your original email and note that you know their time is precious. If you get no response from second follow-up mail, it’s best to assume that the recipient is on the fence or not interested and send a third “soft close” email that states that you appreciate their time and will not email them again. You’ll find that if someone has just been too busy or undecided about getting back to you, this is the time that they’ll act as they do not want to close down the opportunity. Remember, you can always analyse your analytics and reports to find those that have interacted the most with your campaign and follow up with them in a different manner if you’d prefer. My personal favourite is Mailshake. The value for money that this platform provides is amazing. 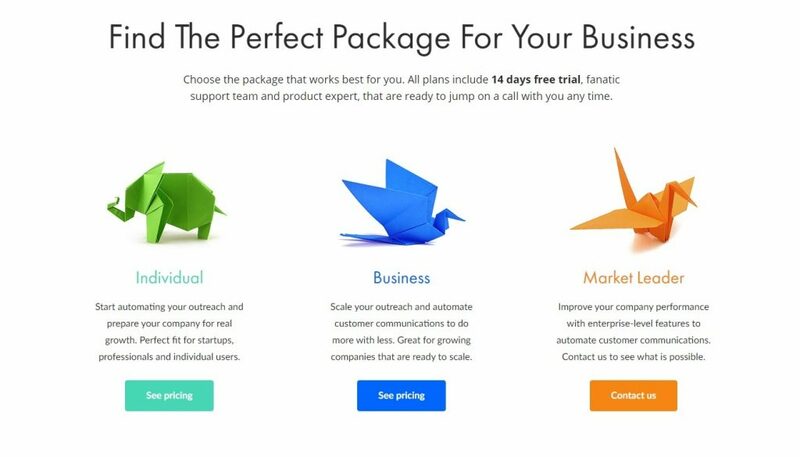 Starting at just $29 per month, Mailshake allows you to implement an outreach strategy and grow your business at scale with its amazing feature set and integrations. Quickmail.io starts at $49 per user per month, has powerful analytics built in and allows you to reach out to 200 contacts per day on their basic plan. Their pro plan includes up to 500 contacts per day, 3 sender email addresses, Zapier integration, and advanced automation. Both plans come with automatic follow-ups, reply/out of office/bounce/open/click detection, no duplicate prospects, do not contact domain lists. 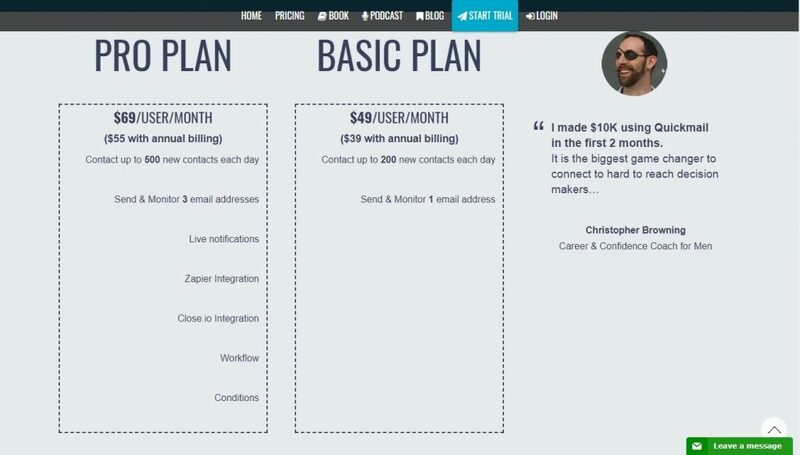 Quickmail.io also offers the ‘Basic’ and ‘Pro’ plans, with discounts on annual plans. Reply.io has an amazing and intuitive user interface that includes advanced reporting, split testing and email campaign creation. 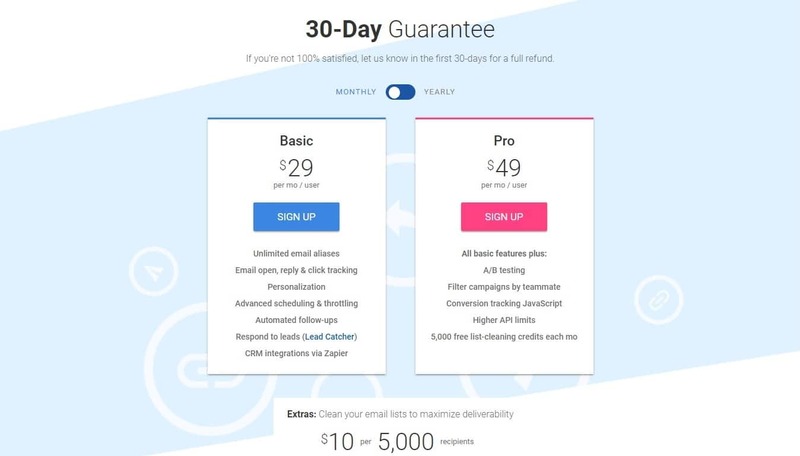 With pricing starting at $40 per month to send just 200 emails per month, it’s definitely on the more expensive side to the other examples we have in this post. That being said, the rich feature set and on-demand support make this platform a robust option for those looking to make email outreach a high-value strategy in their business. 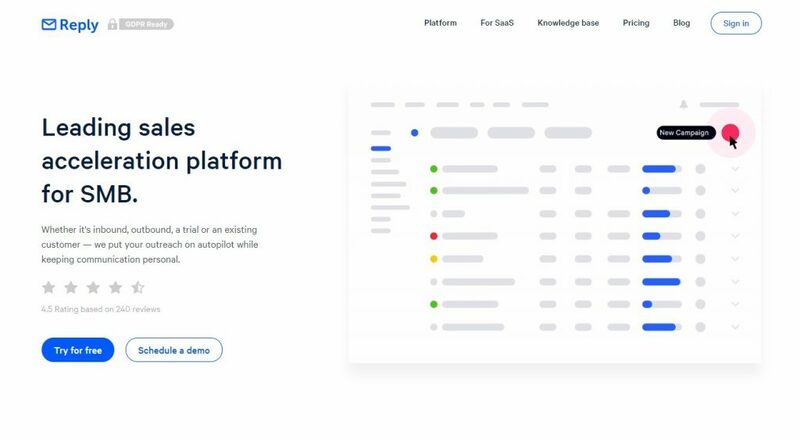 Along with plans for individuals and businesses, Reply.io has a plan for those who want to assume a leadership position in the market. Well, that’s it for now! Hopefully, this information is enough to get you thinking about the many benefits of email outreach tools and how they can play a part in your business. To sum up, these tools can help you generate quality business leads and help you grow your business by helping you pitch to potential customers in an efficient way, all you need is a targeted list of prospects and you’re away. These platforms not only save you time, money, and resources, but also offer excellent analytical insights on how your outreach programme is performing. There are a tonne of email outreach tools in the market, and finding the one that is just right for you shouldn’t be very difficult. If you have recently used an email outreach tool, or plan to do so soon, I’d love to hear from you! Drop me a comment below or reach out at [email protected]. Be the first to receive new insights on how you can use automation and systems in your business to make more sales with less effort.